If you have memories of sunny, lakefront days...sleeping under the stars...fishing with your dad...hitting your first golf ball...and watching as a pristine lake turns golden pink at sunset, then you are the inspiration behind Fyre lake National Golf Club. 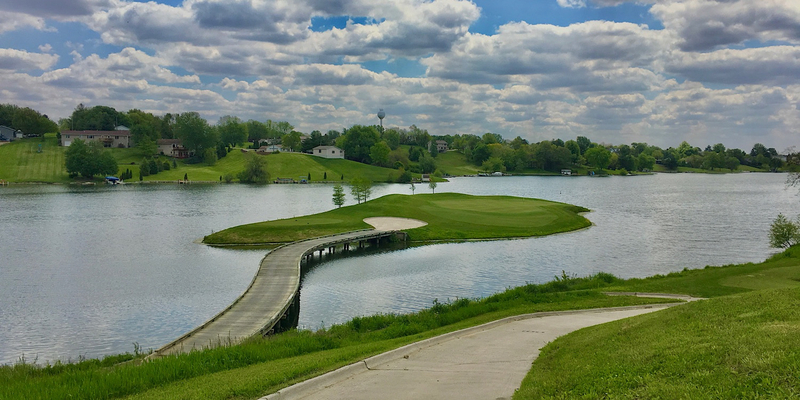 Set amid the rolling terrain and sparkling lake of Sherrard, Illinois ,Fyre Lake National is a golf and lake front residential community that was inspired by the timeless pleasures of lakefront living. And whether as a weekend, seasonal or year-round family retreat, Fyre Lake National offers you a wonderful recreational lifestyle. Regarded as the world leader in golf course design, Nicklaus Design has created a masterful golf experience at Fyre Lake National Golf Club. Eighteen thrilling holes of winding fairways and emerald greens, in a beautiful lake and woodland setting. The Nicklaus Design course at Fyre Lake National Golf Club is, quite simply, among the best. All rates include cart fee. From I-80 West, continue I-280 West for 9.4 miles. Turn left on US-6 East at stop light. At the next stop light at Hwy 6 and 150 S, turn right and follow 150 South for 1.8 miles Turn Right at W 3rd St. (at stop light) before Coal Valley. Follow W 3rd St. (which becomes 104th) for 7.3 miles until it comes to a stop sign at (T) intersection with 175th Ave. Turn Right onto 175th Ave. and follow for 1 mile to the BP station. Turn Left onto 310th St. (.3 miles) to entrance to Fyre Lake. From I-80 West take the exit for I-74 East toward Peoria for 10 miles. Take exit 24 for IL-81 to Cambridge/Kewanee turning Right onto IL-81/CR-7/Camp Creek Rd. for 6 miles. Turn Right onto Knoxville Rd./CR-4/175th Ave. at stop sign for 4.4 miles. From I-74 West, take exit 24 for IL-81 to Cambridge/Kewanee turning Left onto IL-81/CR-7/Camp Creek Rd. for 6 miles. From I-80 East, take exit 290 for US-6 East/I-280 East toward Moline/Rock Island and merge onto I-280 East for 14 miles. Turn Right onto Knoxville Road/99th St. for 1.4 miles. Turn Right onto 175th Ave./190th Ave/CR-2 for 1 mile. 30 day in advance reservation policy. Contact Fyre Lake National Golf Club at 309-644-4575 for more information and details on holding a golf outing at the course. Contact Fyre Lake National Golf Club at 309-644-4575. Contact Fyre Lake National Golf Club at 309-644-4575 for onsite or nearby dining options. A Wild Ride with Remarkable Views! This profile was last updated on 11/11/2016 and has been viewed 18,738 times.